Hello ... Hello ... my old friends ... It's great to see you once again! When Chris Brighton opened the evening with the words: "This is not a tribute. This is a celebration of the genius of The Beatles. ", he couldn't have been more honest and accurate as the new look Abbey Road Experience delivered two  scintillating and entertaining sets of Beatles classics to a near full house at Aldridge Youth Theatre last night [Saturday 16th November]. 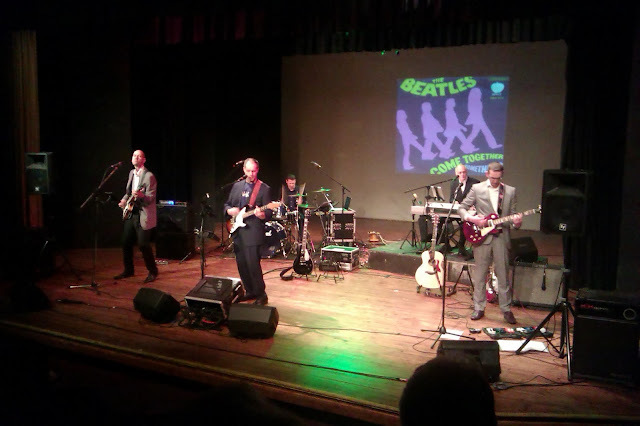 The Abbey Road Experience are: Chris Brighton [Lead vocals/Guitar]; Colin Noon [Keyboards], Mike Tinsley [Vocals/Bass], Nick Mellor [Guitars] and Darren Ashford [Drums] delivered a superb rendition of the whole of the iconic Beatles #1 album "Abbey Road" live during the first set: "Come Together"; "Something"; "Maxwell's Silver Hammer"; "Oh! Darling"; "Octopus's Garden"; "I Want You [She's So Heavy]"; "Here Comes the Sun"; "Because"; Medley: "You Never Give Me Your Money"/"Sun King"/"Mean Mr. Mustard"/"Polythene Pam"/"She Came In Through The Bathroom Window"/"Golden Slumbers"/"Carry That Weight"/"The End"; "Her Majesty"
Classic Beatles followed during a marvellous second set which included: "Nowhere Man", "Don't Let Me Down", "Drive My Car", "If I Needed Someone", "Lady Madonna", "In My Life", "And Your Bird Can Sing", "Let It Be", "Paperback Writer", "Fixing A Hole", "Help! ", "Get Back", "Taxman", "While My Guitar Gently Weeps", "Let It Be", "Sgt. Peppers Lonely Hearts Club Band", "Back In The USSR", "Got To Get You Into My Life" and "Hey Jude". 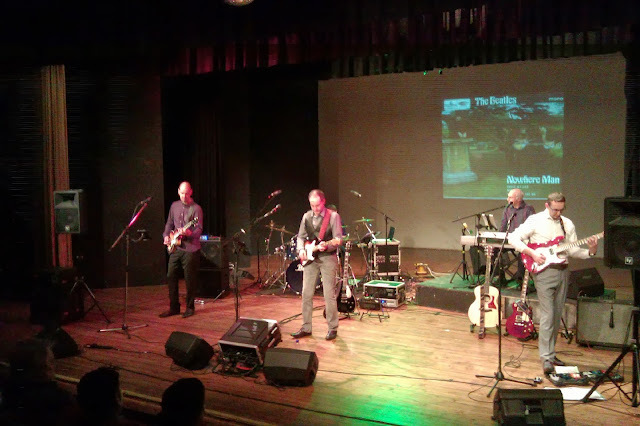 The highlights for me were the George Harrison composed covers [especially "While My Guitar Gently Weeps"] with the immaculate and awe inspiring guitar craft of Nick Mellor [as it was throughout the concert] and the clear, soaring lead vocals of Chris Brighton. The inspiration for the conception of The Electric Light Orchestra [ELO] and the influence of The Beatles over Jeff Lynne and Roy Wood was there for all to see and hear. Yours Truly KJS sincerely hopes that there are more added in the near future to their current gig roster. 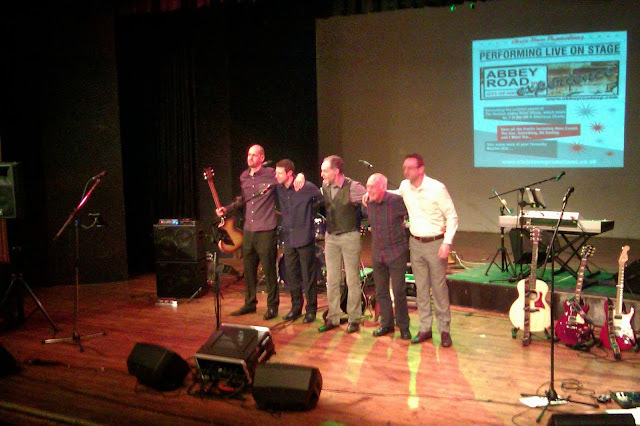 There are several Abbey Road Experience gigs coming up in 2014 thus:. ELO Beatles Forever [ELOBF] recommends The Abbey Road Experience to those enlightened folks who enjoy the music of ELO, Jeff Lynne, The Move, Roy Wood, The Idle Race, 'Brum Beat', The Beatles and related artistes.